The notion that an oil and gas producer can commit a trespass by engaging in hydraulic fracturing gained traction on April 9, 2013, when U.S. District Judge John Preston Bailey of the Northern District of West Virginia denied a motion for summary judgment filed by oil and gas producer defendants Chesapeake Appalachia, LLC, Statoil USA Onshore Properties, Inc. and Jamestown Resources, Inc. in Stone v. Chesapeake Appalachia, LLC. In this case, Chesapeake Appalachia drilled a horizontal Marcellus Shale well with a vertical well bore within 200 feet of the plaintiffs’ property and a horizontal well bore within “tens of feet” of the plaintiffs’ property. Although Chesapeake Appalachia maintains a lease for the oil and gas underlying the plaintiffs’ property, plaintiffs’ lease does not authorize pooling or unitization of the Marcellus formation. Defendants urged the court to follow the ruling in Coastal Oil & Gas Corp. v. Garza Energy Trust, in which the Supreme Court of Texas held that a landowner’s claims of trespass where the operator extended hydraulic fracturing underlying the landowners’ property were barred by the rule of capture, the highly regulated nature of oil and gas in Texas and other reasons. The court declined to do so, explaining that under the rule announced in Garza, oil and gas companies would be able to dictate that a landowner either sign a lease on the producer’s terms or the producer will hydraulically fracture under the property and take the oil and gas without compensation. Observing that under West Virginia law, trespass is an entry on another person’s property without lawful authority, and doing some damage, however inconsiderable, to his real property, the court predicted the West Virginia Supreme Court of Appeals would find that hydraulic fracturing under the land of a neighboring property without that person’s consent is not protected by the rule of capture, but rather constitutes an actionable trespass. Although not expressly stated, it appears that the trespass claim rests on plaintiffs’ allegation that the hydraulic fracturing fluid entered the subsurface of plaintiffs’ property. Wyoming and other Western states need to better track the amount of groundwater that’s depleted by hydraulic fracturing, according to a new report by a regional land-use organization. If the states don’t do so, there may not be water left for municipal and agricultural uses, according to the report by the Billings, Mont.-based Western Organization of Resource Councils, which represents smaller, grassroots land-use groups. “Little notice is given to what in the long term may become a more serious threat,” Bob LeResche, a Clearmont rancher and board member of the Billings organization and the Sheridan-based Powder River Basin Resource Council, said during a Thursday teleconference to promote the report. A truck carrying fracking waste was quarantined and then sent back to where it came from after its contents triggered a radiation alarm at a Pennsylvania hazardous-waste landfill. The truck’s load was nearly 10 times more radioactive than is permitted at the dump in South Huntingdon township. The radiation came from radium 226, a naturally occurring material in the Marcellus Shale, which being fracked for natural gas in Pennsylvania and nearby states. “Radium is a well known contaminant in fracking operations,” writes Jeff McMahon at Forbes. Township Supervisor Mel Cornell said the MAX Environmental Technologies truck was quarantined Friday after it set off a radiation alarm at MAX’s landfill near Yukon, a 159-acre site that accepts residual waste and hazardous waste. [Pennsylvania Department of Environmental Protection] spokesman John Poister confirmed the drill cutting materials from Rice Energy’s Thunder II pad in Greene County had a radiation level of 96 microrem. The landfill must reject any waste with a radiation level that reaches 10 microrem or higher. “It’s low-level radiation, but we don’t want any radiation in South Huntingdon,” Cornell said. Poister said DEP instructed MAX to return the materials to the well pad where it was extracted for subsequent disposal at an approved facility. Pennsylvania is currently studying radiation issues associated with fracking of the shale and disposal of the industry’s waste. A Pennsylvania judge in the heart of the Keystone State’s fracking belt has issued a forceful and precedent-setting decision holding that there is no corporate right to privacy under that state’s constitution, giving citizens and journalists a powerful tool to understand the health and environmental impacts of natural gas drilling in their communities. Judge O’Dell Seneca’s ruling comes in an ongoing case where several newspapers sued to unseal a confidential settlement where major fracking corporations paid $750,000 to a family that claimed the gas drilling had contaminated their water and harmed their health. The Court ordered that settlement unsealed, enabling the papers, environmentalists and community rights advocates to examine the health issues and causes. But where the ruling is likely to make the biggest waves is in the so-called corporate personhood debate. The Judge spent more than a third of her 32-page decision saying why corporations and business entities were not the same as people under Pennsylvania’s constitution, and why, for the purposes of doing business in the state, that federal court rulings that blur the rights of people and businesses do not apply. 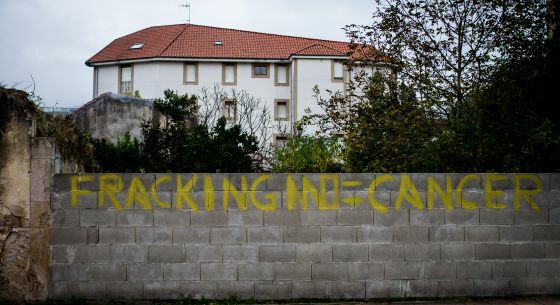 Anti-fracking graffiti painted on a wall in the town of Selaya in Cantabria. / L. H.
Their campaign has pushed the Cantabria regional parliament to begin debating a bill to make this practice illegal, even though the technique has the endorsement of the Industry Ministry. Since 2011, six shale gas exploratory permits have been granted in the small mountainous region: five by the Industry Ministry and one by the former regional government of Miguel Ángel Revilla. In the rest of Spain, the ministry has given permission to 22 companies to explore for gas by fracking in some 400,000 hectares of land, with most of the operations now taking place in the Ebro river basin. Hydraulic fracking is an extreme water-intensive process for obtaining gas encrusted in small pockets of rock deep beneath the Earth's surface, at around 2,500 meters. Between seven and 15 million liters of water mixed with sand and chemicals - some reportedly carcinogens - are pumped below under high pressure to ensure the rock breaks and gas is released. After months of protests in the region, the Cantabria government of Ignacio Diego, of the Popular Party (PP), last December drafted a bill to prohibit fracking. If passed in two to three months -- as the regional government expects -- Cantabria will become the first region in Spain to ban the method. 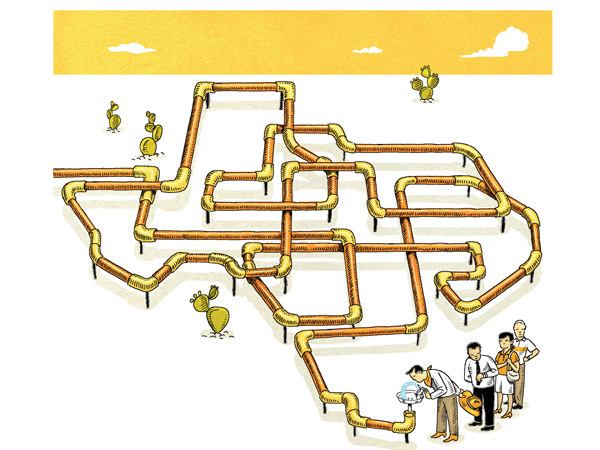 The implications have finally sunk in among lawmakers and business leaders here, who like to boast about the economic appeal of Texas’s low taxes and relaxed regulatory environment: no water equals no business. In a state fabled for its everything-is-bigger mentality, the idea of conserving resources is beginning to take hold. They are even turning sewage into drinking water. The overwhelmingly conservative and tightfisted Texas House of Representatives recently voted to create a fund to finance water development and conservation projects and is considering allocating $2 billion to jump-start it. The State Senate is weighing a similar measure. The state’s water plan, released last year, recommends spending $57 billion (in 2013 dollars) over the next half-century to ensure there is enough water to go around; Texas’s population of 26 million is expected to grow by 80 percent by 2060. Texas is also suing neighboring states to get more water. The United States Supreme Court is scheduled to hear arguments in two weeks in one of these cases, in which the authority that supplies water to Fort Worth and fast-growing surrounding communities is demanding more water from Oklahoma. Texas has accused New Mexico of siphoning off more than its share of water from the Rio Grande. The state is likewise arguing that under an international agreement, it is entitled to more water from Mexico, which has also been stricken by drought. The bill has already passed the Senate, and is on track to pass the full House. It is part of a wave of similar legislation introduced across the country that have been dubbed “ag-gag” bills. [Here's a detailed look at ag-gag efforts nationally.] But Indiana is poised to become the first state to pass an ag-gag bill this year. This ag-gag trend is the brainchild of the Big Ag industry, working with the American Legislative Exchange Council. What’s especially troubling about Indiana’s bill, though, is that it extends far beyond factory farms to the timber, mining, and manufacturing industries. While the craven New York State Legislature has been AWOL on vital gas drilling issues for years, state court judges, fortunately, have been quietly doing their job. 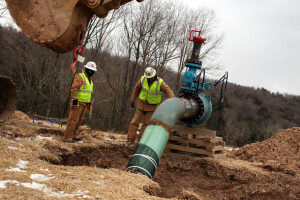 Last week a state Supreme Court judge in Rochester smacked down efforts by a subsidiary of Royal Dutch Shell to purchase fresh water to frack its Pennsylvania gas wells from the financially down-and-out Village of Painted Post. At the behest of the thirsty energy giant, Painted Post had attempted to “short-circuit” New York State’s environmental review process, Supreme Court Justice Kenneth R. Fisher wrote March 25. The village draws its water from the Corning aquifer, a relatively shallow, rain-dependent source that also supports several other communities. It has been selling water to Shell subsidiary Swepi LP under a contract that could provide it a reported $2.6 million a year for supplying up to 1 million gallons of water a day. 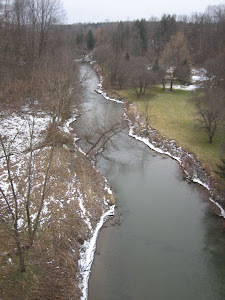 Fisher granted an injunction to halt the sale and rail shipment of the water to Wellsboro, Pa., about 40 miles south. Now Painted Post must comply with the State Environmental Quality Review Act before its sells any more water to Pennsylvania frackers. That’s just common sense, and it’s the law. This is neither the first nor the most far-reaching case in which state courts have blocked efforts by the oil and gas industry to Bigfoot its way into New York after stepping over the law. Earlier last month, a judge in Livingston County rejected an industry challenge to the Town of Avon’s moratorium on gas drilling. That ruling dovetailed with previous state court rulings upholding drilling bans in Dryden and Middlefield. In each case, industry lawyers claimed that a 1981 state law grants the state Department of Environmental Conservation unchallenged power to site gas wells throughout the state. That flimsy argument ignores the fact that local governments have zoning powers that are guaranteed under the state constitution. The bottom line in the Avon, Dryden and Middlefield cases: the courts say DEC can regulate the “how” of gas drilling, but localities still get to say “where” it is allowed or banned. That’s not enough for the gas industry. It still insists that constitutionally protected zoning rights were somehow quietly expunged, even though the DEC itself disagrees.